State Level Bankers Committee (SLBC) is an important forum which is the fulcrum of development for the state. Development happens partly through government efforts, private enterprise and initiative of entrepreneurs who drive the economy with underwriting by the banks. The SLBC therefore is a forum where administration meets financial institutions to jointly brainstorm for the developmental agenda of the government. This was stated by the Chief Secretary J&K Government B V R Subrahmanyam while presiding over 108th SLBC meeting held here at SKICC. The meeting attended by the Principal Secretary Finance Navin Kumar Chaudhary, Deputy Secretary, DFS, (MoF, GoI) A K Dogra, General Manager Reserve Bank of India A K Mattu besides other senior functionaries of the state government, banks, NABARD, Insurance Companies, BSNL etc. The Deputy Commissioners of all the districts also participated in the meeting. He urged the bankers led by the Convener Bank to use the government system to drive the banking activities and put in strenuous efforts to improve the credit flow to the productive sectors in the state. “All the government officials are at your disposal. They are all team players with you. Let us move ahead in tandem and in next three to six months we see some synergy in the implementation”, he asserted. Earlier, J&K Bank Chairman and CEO (Convener J&K SLBC) Parvez Ahmed while welcoming the Chief Secretary Shri Subrahmanyam on behalf of all the member banks expressed enthusiasm and optimism in his guidance for resolution of issues of bankers forum with innovative conduct in the backdrop of his exemplary experience. 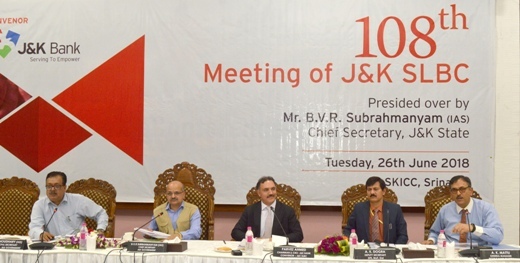 The Chairman and CEO J&K Bank also acknowledged contribution of Shri B B Vyas who as Chief Secretary not only provided esoteric inputs for the direction of the forum but also fast tracked the resolution of some long standing issues. While briefing the house about the credit scenario in the state he informed: "Banks operating in J&K have extended a total credit of Rs 23592.91 Cr in favour of 733025 beneficiaries registering an achievement of 82 pc in financial terms and 76 pc in physical terms during the Financial Year ended March, 2018 against the annual target of Rs 28841.64 Cr for 966047 beneficiaries under Annual Credit Plan 2017-18." He said, "Jammu and Kashmir Bank alone has disbursed Rs 16823.43 Cr during the period under review, which makes for 71 pc of the total credit extended by the 43 banks and financial institutions operating in the State." Commenting on the performance of banks in Government Sponsored Schemes in the State, Parvez Ahmed said “The unsatisfactory achievement of 61 % under Government Sponsored Schemes is a matter of concern despite number of decisions taken by SLBC for increasing credit flow under these schemes including the formation of a committee under Chairmanship of Administrative Secretary, Finance Department to identify the reasons of poor performance under Government Sponsored Schemes. There is an urgent need of integrating the sponsored schemes by creating an ecosystem of capacity building for the aspiring entrepreneurs besides inculcating an approach of handholding and facilitation to achieve the objectives of poverty alleviation and employment generation. It is imperative that the LDM, RSETI, FLCC and the sponsoring departments work in collaboration for improving the quality of sponsorship by identifying the right candidates , timely sponsorship, training and monitoring of beneficiaries to achieve 100% targets."